The local co-op delivered a fertilizer buggy full of ammonia nitrate to our farm this morning, along with 900 pounds of 0-20-20 in bags. 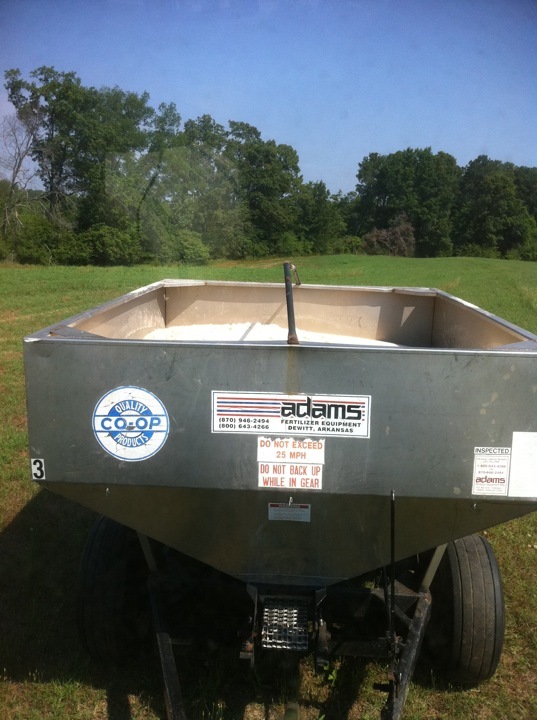 I spent most of the morning pulling the buggy across hayfields (still 3 more acres to go) while one of our employees spread a mix of the bulk and bagged fertilizer on a few acres of our bottomland that was too wet for the spreader truck to cross last week. We aren't really hurting for moisture down in the bottomland. The corn we planted last Wednesday has already emerged, and it looks as if we'll have a good stand down there. The land around our dairy is a different story though. Our hayfields are green, but the bermudagrass isn't growing as quickly as it needs to due to a lack of water. The current forecast calls for a slight chance of thunderstorms Saturday through Monday, so hopefully three days of 30% equal a 90% chance we'll get at least one shower. Regardless of if we use a no-till or minimal-till method to plant our forage sorghum, that job is also on hold until we get some rainfall. Our target date for planting had been mid-June, and that's still a possibility if we get any substantial rain within the next 10 days. We do have a fairly forgiving planting window on the sorghum, though, as we've planted it successfully as late as early July. So until it rains, we'll tinker around in the shop, maybe spray a few pastures, and keep the cows as cool and comfortable as we possibly can as the heat creeps towards 100 degrees later this week. It's finally time to plant some corn! How young should a "young" farmer be? Wordless Wednesday: Gimme some rubbin'!